V. Lane Rawlins was chosen by the Board of Regents on February 3, 2000 to serve as the ninth president of Washington State University. At the time, he was president of the University of Memphis. On June 8, 2000, he came home to WSU where he had previously served as an economics professor and academic administrator. Throughout his presidency, he advocated the vital connections between outstanding undergraduate education and world-class research. Soon after his arrival, Rawlins appointed faculty and staff to nine “design teams” to develop key goals and major objectives for the next 5 to 10 years. Noteworthy outcomes include enhanced undergraduate education, substantial growth in research funding, increased enrollment of high-ability students, and a more diverse student body. New units, such as the Office of Undergraduate Education, the Center for Integrated Biotechnology, and the Office of Equity and Diversity, were established. WSU’s regional campuses gained greater flexibility to serve their individual areas, their executive officers became chancellors, and the Pullman and Spokane campuses were designated as co-located, recognizing close linkages in their educational and research programs. WSU Vancouver welcomed its first freshman class in fall 2006 and WSU Tri-Cities did the same in fall 2007. Important new facilities were opened during the Rawlins era. On the Pullman campus, research buildings for shock physics and plant biosciences, as well as the student-funded Student Recreation Center, opened. New offices for the WSU Foundation opened in downtown Pullman. In Spokane, the new Health Sciences Building opened early in Rawlins’ tenure, followed by the Academic Center in fall 2006. WSU Vancouver opened a Multimedia Classroom Building and began construction of a Student Services Center, while a bioproducts, sciences and engineering laboratory got underway at WSU Tri-Cities. Rawlins also established new traditions. December commencements were added and Cougar Pride Days launched. The Regents Scholars program was created to attract Washington’s top high school graduates. The Eminent Faculty and Regents Professors awards programs were introduced to honor exceptional faculty members. Showcase, a day to celebrate faculty and staff achievement, was launched. “For us the destination is becoming increasingly clear. We want to be and can be one of the elite institutions in the world in both education and research,” President Rawlins said in his final State of the University Address in September of 2006. Congruent with his vision was the selection of several more WSU professors to the National Academies and the designation of WSU as a top-tier research university in key classifications and rankings during his administration. Rawlins started his academic career at WSU in 1968 as an assistant professor of economics, fresh from earning his Ph.D. in economics from the University of California, Berkeley. A native of southeast Idaho, he completed his bachelor’s degree in economics at Brigham Young University in Utah. He published widely in major journals and co-authored books on labor economics and public policy. He served as chair of the Department of Economics from 1977-1981 and as vice provost from 1982-1986. He then left WSU, serving 5 years as vice chancellor of the University of Alabama System and president of The University of Memphis from 1991 to 2000. 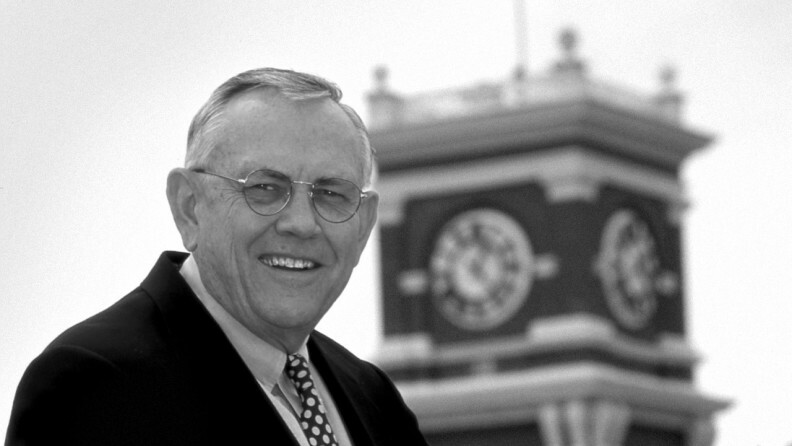 Inaugurated as WSU’s ninth president on March 28, 2001, he was the first WSU president to have been a member of the University’s faculty earlier in his career. Rawlins received recognition for his leadership and communication skills. He served as a member of the Governor’s Global Competitiveness Council and the Technology Alliance Board of Directors. He also served as the Pac-10 representative to the NCAA. In the spring of 2007, the WSU community recognized Rawlins and his wife Mary Jo for their exceptional service to the University. In June 2007, Rawlins retired from the presidency and returned to the faculty in the WSU School of Economic Sciences. He subsequently was appointed interim director of the William D. Ruckelshaus Center, a joint program of Washington State University and the University of Washington that fosters collaborative problem-solving in the region. In 2010, Rawlins accepted the offer of interim president at the University of North Texas. At the request of the chancellor and regents of UNT he extended his term until 2014. He has since returned to the Northwest and maintains an office at WSU in Pullman. While Rawlins will long be remembered for his visionary and strategic leadership, he will also be remembered for his interest in the successes of individual students, faculty, and staff members; his desire for the campuses to always look their best; his sense of humor; and his affection for the University.